I am really surprised to say this, but I really wound up liking this book. I was having a bit of a hard time getting into things at the time, but this book was entirely different from what I had been reading and it worked really well. 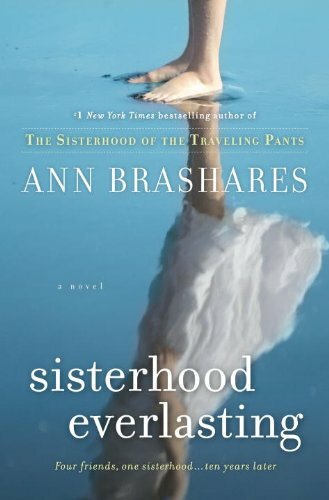 This is the fifth book in the famous Sisterhood of the Traveling Pants series and is hands-down the best of the lot. The characters are older, though, so that could be part of the appeal. It was really interesting to see what happened to them in the 10 years since the 4th book took place. They think that have everything that they wanted from life, but drastic changes take place that change everything. I was a bit worried about the direction the book was going in, but it actually all worked out for me. The four friends have been close since they were babies, but things have happened in the last 10 years that has driven them apart. A lot of it is distance and not knowing how to bridge it anymore when it is only part of the group. Tibby has moved all the way to Australia, so she is not in close contact at all. She decides, though, that the four of them have to reconnect and so she sends them plane tickets to do just that. After this, nothing will ever be the same again. The first problem is that after the reunion, things have changed so much that the girls still don't know how to connect with each other. It isn't until other events happen that Tibby finally succeeds in bringing them together. It was a touching story and yes, it was a bit of a coming-of-age story. Normally I don't like that so much, but it suited my mood at the time. These were characters that I had spent time with before, though, so it made it a story that I was all ready invested in. I think writing a book that followed up right after the fourth book never would have worked. It was a smart idea to set it in the future and then flash back to the events that happened during those years when it pertains to the story. I quite enjoyed this book. It was a satisfying end to the series. I received this book for review from Random House Canada. I am not sure how I feel about the idea of this book, albeit without having read it. Was it necessary for a new book, or is it just capitalising on the success of the original series. I will read it eventually to decide for myself. I really enjoyed the rest of the series, so I'm glad to hear this one is pretty good. I'll definitely be checking it out. I just loaded this onto my MP3 player to listen to on audio - I'm so glad you thought it was a worthy finish to the series! I'm only on book two of thise series and really like it. Didn't know about this fifth one, sounds good! I read one and two but if you're saying this is the best one of them all then I need to get 3-4 read now!! **Carrie: I saw that you have listened to it. **Audrey: It was probably her milking on a successful series, but oh, well.